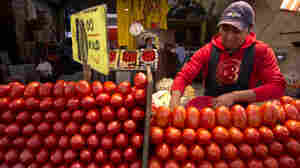 September 28, 2012  Talk of a Tomato War is simmering, after the U.S. Commerce Department recommended ending an agreement on how fresh tomatoes grown in Mexico are sold in the United States. 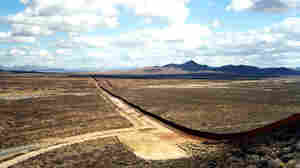 The issue could create an expanding trade conflict; Mexican officials have promised to retaliate. 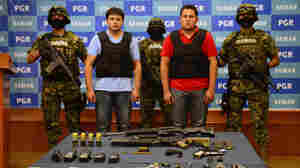 September 18, 2012  The new crisis in Mexico isn't the drug war or a plunge in the peso. It's eggs. An avian flu epidemic has led to fewer, more expensive eggs — serious business in a country that eats more eggs, per capita, than any other nation in the world. September 10, 2012  Mexico's growing middle class is buying more stuff from the U.S.
July 2, 2012  After a 12-year absence, the Institutional Revolutionary Party (PRI) is back in power with the election of Enrique Pena Nieto as president. He has promised the party won't return to its corrupt ways. June 5, 2012  In the Zapotec culture of Oaxaca, there's a commonly accepted category of mixed gender — people called muxes. A photo essay blurs lines between gay and Catholic cultures there. May 14, 2012  Early reports put the death toll from the latest drug violence at 49. But the numbers of victims may even higher. Mutilated bodies were dumped on a highway. 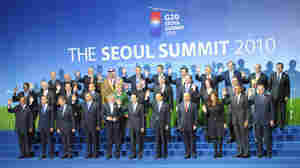 In A Leaderless World, Who Wins? May 4, 2012  On today's show, we take a world tour with Ian Bremmer to find out who thrives and who struggles in a world where no one's in charge. April 21, 2012  In a massive investigation, The New York Times reported Saturday that Wal-Mart Stores Inc. silenced a vast bribery effort carried out by top executives of its Mexican subsidiary in order to build stores across the country. April 20, 2012  A video that caused a sensation in Mexico for using child actors to highlight social and political challenges has been removed from both YouTube and the website of the group that produced it. Despite being online for less than a week, "Niños Incómodos" was viewed more than 1.8 million times. April 12, 2012  A realistic and fast-paced "mockumentary" shows violence and corruption in Mexico — portrayed exclusively by child actors. The video, which challenges politicians to improve life in Mexico, has been viewed more than 1.8 million times since it was posted on YouTube Monday. 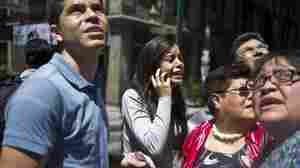 March 20, 2012  The quake was centered 120 miles east of Acapulco. November 11, 2011  Secretary of the Interior Francisco Blake Mora ran the ministry that oversees police agencies forces battling drug cartels. 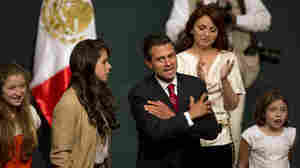 Mexico's president said the accident may have been caused by bad weather. 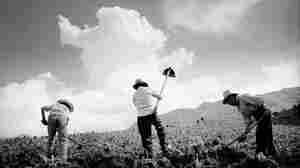 June 24, 2011  Once upon a time, photographer Matt Black heard a mysterious language that led him to ghost towns in remote Mexico.